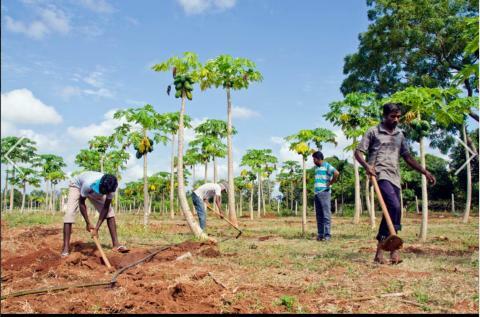 A returnee (2nd from right) oversees work on his pawpaw farm in Sri Lanka. Photo: UN Migration Agency 2014. Rome/Geneva , Jan 25 2018 - In view of the co-chairmanship of the Global Migration Group (GMG) this year and to further strengthen their collaboration, the Food and Agriculture Organization (FAO) and the International Organization for Migration (IOM) have signed a new Memorandum of Understanding (MoU). Comprising more than 20 UN agencies, the GMG has been recognized as a source of technical support and advice to the Member States, and will be co-chaired by FAO and IOM in 2018. The new agreement will serve as a basis for FAO and IOM to mainstream a development approach in global initiatives and fora on migration, highlighting the importance of agricultural and rural development in the context of migration. It will also enable strengthened collaboration in strategic advocacy, generating and sharing knowledge, and advice on the design, implementation and monitoring of programmes countries adopt to include migration into their national development policies. Closer ties are crucial in view of intergovernmental negotiations leading to the adoption of the Global Compact for Safe, Regular and Orderly Migration (GCM) by the end of 2018. The Global Compacts to be crafted this year – one for migration and a separate one for refugees – will be the product of a country-led process and will provide a comprehensive set of common principles and approaches to improve, complement and reinforce policy frameworks at the national, regional and global level. IOM is the leading international organization for migration and joined the UN system in 2016. FAO’s focus on food security, smallholder farmers and rural development offers a unique opportunity to address some of the key factors behind forced migration. Migration requires a comprehensive and integrated approach, which takes into account the many factors that impact migration, including agricultural and rural dimensions. IOM’s focus lies on improving migration governance, through its worldwide network of field offices working on policy and technical assistance, capacity building and emergency response. FAO has a strong focus on addressing the drivers of irregular migration, and harnessing the development potential of migration by investing in job creation in rural areas of origin and increasing the stability and resilience of rural households. Both organizations call for explicit recognition of migration – both its causes and its potential – in national policies on climate change as well as rural development. The decision to strengthen the collaboration between FAO and IOM was reiterated in 2016 when FAO Director-General José Graziano da Silva met with Ambassador William Lacy Swing, IOM Director-General, on the margins of the World Humanitarian Summit. In July 2017, during the 40th session of FAO Conference, the two leaders spoke on measures needed to contrast climate-induced and launched a joint brief on the subject. The two Organizations are also collaborating with IFAD, WFP and OECD for the development of a joint technical report on the interlinkages between food security and migration. As GMG co-chairs in 2018, FAO and IOM will be closely collaborating with the Office of the Special Representative of the Secretary General in line with the request raised in the Secreary General’s report Making Migration Work for All to the United Nations to be a source of ideas and policy guidance, as well as a convener, for the implementation of the New York Declaration and the Global Compact on Migration.